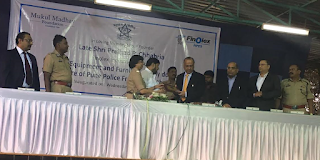 Chandigarh, 23rd December, 2016: Mukul Madhav Foundation and Finolex Industries Ltd. recently aided the Pune Police Hospital by facilitating them with additional medical equipment, to help upgrade their current setup. Conducted in honour of Late Shri. Pralhad P Chhabria (Founder- Mukul Madhav Foundation and Finolex Group), the inauguration was held on Wednesday, 21 December 2016, at the hospital premises, at the hands of Hon. Commissioner of Police, Mrs. Rashmi Shukla. Other prominent personnel gracing the occasion were Mr. SheshraoSuryawanshi (Deputy Commissioner of Police), Mr. Sunil Ramanand(Joint Commissioner of Police) Mr. Girish Bapat(Guardian Minister Pune), Mr. Prakash Chhabria, (Executive Chairman, Finolex Industries Ltd.) and Mrs. Ritu Chhabria (Managing Trustee, Mukul Madhav Foundation) amongst others. Finolex Industries Limited (FIL), headquartered in Pune, is the market leader in the supply of PVC pipes & fittings for the agriculture and non-agricultural sector that includes housing, industry and construction. Through our unique expertise, we have been able to focus on the concept of Water Management, which will become even more crucial in the coming years. Finolex Industries Limited is India’s largest backward integrated PVC Pipes and Fittings’ manufacturer with a production capacity of 3,50,000 MT per annum. Our state-of-the-art manufacturing plants at Urse (Pune), Ratnagiri in Maharashtra and Masar in Gujarat help to provide significant resources to better serve customers. Our own resin manufacturing facility in Ratnagiri, set in technical collaboration with Uhde GmbH, Germany with Hoechst technology, and spread across an area of 650 acres of land, provides a consistent supply of superior quality resin to our plants which guarantees top line quality products. Our open sea cryogenic jetty, the first of its kind in the Indian private sector, has been the hallmark of our PVC complex. We are the first Indian PVC Pipes manufacturer to have been awarded the ISO 9001:2008 certification. We consistently produce only the highest quality products and provide exceptional service in order to maximize customer satisfaction. We are marching ahead in innovation and technology, bringing forth new products and solutions by continuously increasing our production capacity. This, in turn, aids us to meet our strategic goals for the future. We pride ourselves in being able to maintain and constantly improve living standards through our product offerings, as we serve the growing needs of our nation, by remaining committed to our core values of providing impeccable quality products and services. Our major strength lies in our skilled workforce. We recognize and attribute our operating excellence and success to our employees. We have an extremely strong presence throughout the country, with a wide network of over 17,000 dealers and sub-dealers who work as our extended arm in bringing quality products to customers. Our core values of quality, trust and integrity help us build an unbreakable bond with customers and stakeholders. We believe in “Performance with Purpose” and are deeply concerned about society and our community. We have been actively working along with Mukul Madhav Foundation, our strategic CSR partner, in contributing to the social and economic development of the underprivileged sections of society in and around our plants in Ratnagiri, Pune and Masar with special focus on education, healthcare, community development, environment and self-development. Our focus is on women and children, thus, enabling the deprived to improve their quality of life through good education and accessible healthcare facilities. We strive to seek a way to connect our urban population with the rural and urge people to pledge to save water and the environment.